Working "down under" is a dream for many job seekers. How about getting a job on a cruise ship in Australia? Fantasea Adventure Cruising was nice enough to speak with CruiseJobFinder about how their Australia-based cruise line goes about hiring its staff. Read this interview excerpt to learn ways you can launch your own cruise industry job search. 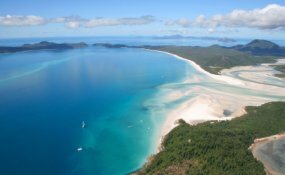 We are a major Eco-Certified marine tourism operator in the Whitsundays region taking daily cruises to the Great Barrier Reef and surrounding coastal areas. We have been around for 25 years and offer tailor made group tours for corporates, weddings, schools, and social clubs. We are very proud to be one of the only 50 companies in Australia that have been Eco-Certified for more than 10 years now, and we received official recognition in 2010 as a "Green Travel Leader." I am the HR manager in charge of all staff hiring and also run the main office. Describe a typical 'cruise' if there is such a thing. Our employees need to have an interest in the environment and must typically showcase the natural beauty of the area to the tourists. They generally need to educate and advise tour groups about the wildlife (we have a large Humpback Whale population that visits every year between June and September), and marine life in the Great Barrier Reef. We hire for different departments including marine crew (engineers and skippers), hospitality staff who work on board the vessels and at our unique floating accommodation (Reefsleep), and In-Water Team members such as marine biologists who lead diving and snorkeling groups around the Reef. We also hire customer service representatives, German, Japanese and other translators, on board photographers, and cruise attendants. We offer a unique experience as a leader in the eco-tourism industry. We provide career advancement through the experience we give to our employees in all areas. We offer competitive wages and give people the chance to follow their dreams, working in one of the most beautiful spots in the world. We have a huge influx of tours during the whale season, which is June through September, but summer months around November and December holiday times are also busy. It is hard to say as we will usually have to hire based on the staff stay on and which people leave us. Some of our staff want to change jobs from working as a cruise attendant for instance, to being based at Reefsleep, so these are other factors we have to consider. Most positions we hire for seasonally are cruise attendants and serving staff, bar tenders, and some catering staff. We want people who love what they do - they must have a passion for the outdoors, for nature and marine life. We are an eco-friendly operator, so we prefer that employees are eco aware and confident enough to educate guests about the areas we travel to. You should be friendly and warm, have a great attitude, with a willingness to get stuck in and learn, as well as being a good team player. A friendly, approachable nature is what most cruise jobs require, as well as confidence. Excellent customer service skills will get you far, as will a genuine love of the sea. Come ready to impress. Dress well, show us your vibrant personality, speak confidently and clearly, and try not to be nervous. We are a friendly bunch, and we want to see that you are the right fit, so just be yourself! There are plenty of these. While it is fun and almost all employees tell you that they are "living the dream," it does not mean you are on holiday. You still have to work really hard and be on your feet all day. Lots of people think that they will get to snorkel and enjoy the sunsets like the tourists, but you will probably be scrubbing down tables, getting hot and sweaty running up and down to the galley, or working in the engine room.